As the Milky Way looked down upon Leverhulme Park through the clear skies at 5.45am (for a select group of stargazers), the prediction of great day was made. It certainly came true with perfect running conditions (8oC, bright sun and no wind) and many stars shining. First and foremost of these were the volunteers that enabled another amazingly slick and safe event to be carried off by the Club. With names too numerous to highlight individually, organiser Nick Howarth praised the efforts of the all who erected (and dismantled) the course, manned the car-parking, staffed registration, marshalled, and aided in the finish area with de-chipping, water and mementos. Truly a fantastic effort – without your assistance, these races would not be possible. 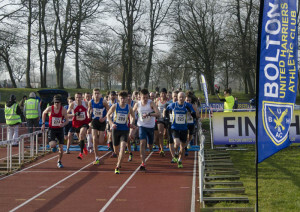 As the traditional CLGP season curtain-raiser, the CL5K’s redesigned course promised to be fast. Some eager beavers at the startline wanted to get away before the B of “bang” and they took little time to show why. With no extra distance this year (! ), a breakaway group of five at 1km was reduced to three led by Tom Carson at the halfway mark. 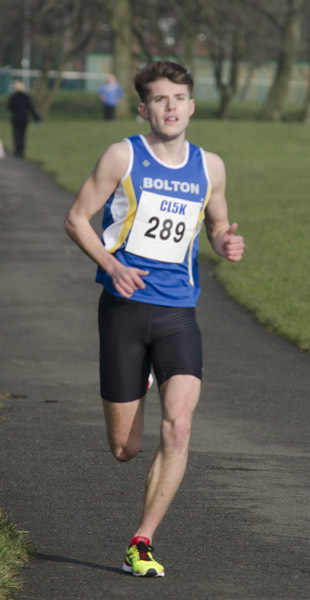 The 25m gap by 4km was reduced to 15m by Bolton’s Jonny Kay with 300m to go, but it was too much to bridge, as ex-BUH&AC Carson maintained the buffer before slowing in the last 50m as exhaustion crept in to record victory by 4 seconds in 16 minutes dead. Still, it was a superb run from Kay, who looked the more settled in the early stages and is still building back to full fitness ahead of next week’s appearance at the National XC Champs. Leigh’s Callum McCormick took a well-deserved bronze, being runner-up to Kay in the U20 standings. Lytham St Annes’ Joanna Goorney obliterated the women’s race, cantering to 19:54 win – nearly a minute ahead of Spenborough’s Lesley Leggett (20:41) and Bingley’s Anne Buckley (20:52). 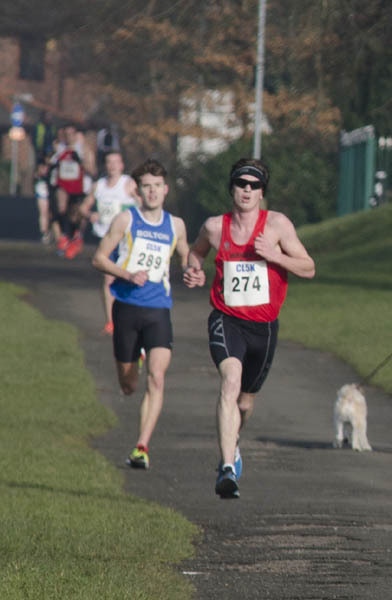 Some folk were breathing hard after the drag of Spooky Hill at 2km, perhaps having gone off too quickly, but Karl Darcy did his now customary negative split with a quite stonking seventh position (16:43). Exciting junior prospect Declan Toomey (10th) was third counter for the race team that collected 19 points for second place behind Leigh (17). New BUH&AC CLGP team captain Mark Swannell lost a narrow battle with M40 compatriot Shay Walker by 4 secs, whilst the ‘D Shaw’ tussle was taken by Danny (23rd) from Dave (25th). The CLGP Team A (first ten counters) was bookended by Chris Povey, Andrew Doyle and debutant Scott Crompton, helping the Blue Vests to a reversal of the race standings – a victory with 152 points to Leigh’s 184. The CLGP B Team, which comprises competing clubs’ next 8 runners (i.e. positions 11-18), was led home Ben Scott, though standout performances came from junior Liam Doherty and team manager Nick Howarth in the M50 cat. 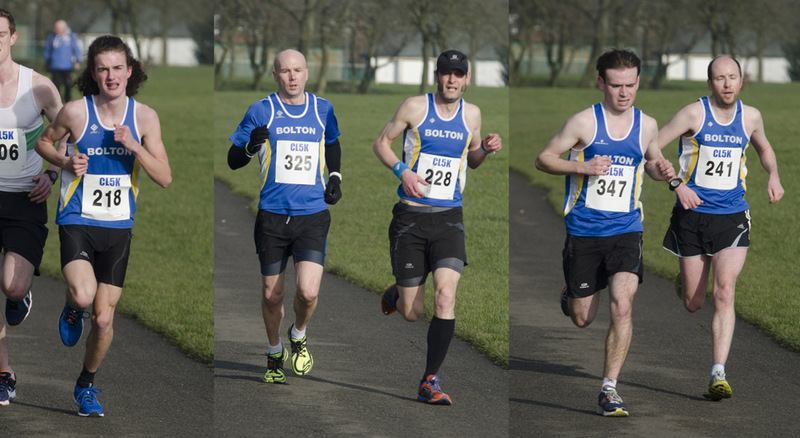 Their 328 points marked a convincing win over Burnden Roadrunners (748). Bolton’s female race team podiumed, with Cathy Flitcroft (13th) leading the top two juniors Georgia Greenhalgh and Olivia Kearney for bronze. Lea Taylor, pushed hard by Donna Cooper and junior debutants Mercedes Mercer and Megan Robinson, was final counter for the women’s CLGP team points. 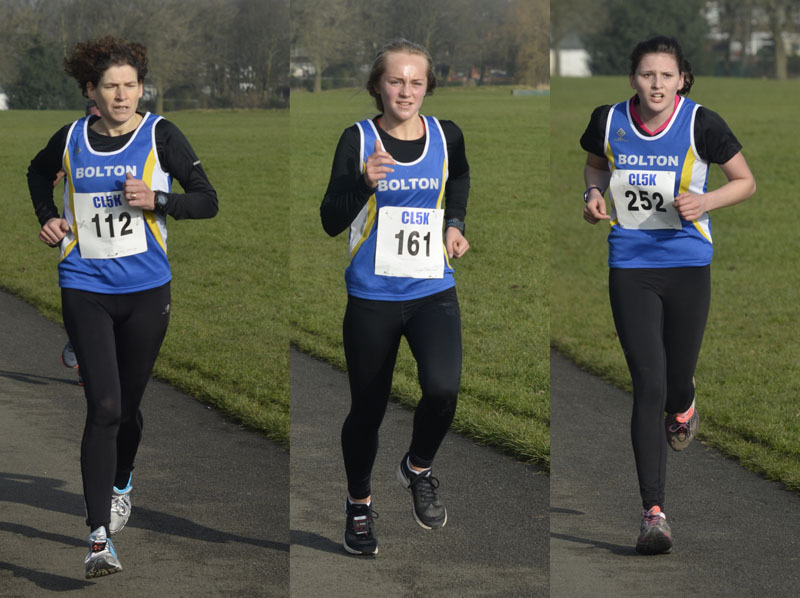 Pleasingly, they hit their 2015 target of a podium spot, and with 16 members racing, including CLGP first-timers Zoe Gibson and Deborah Flitcroft, a real team spirit is building. Adrienne Fisher’s improvement through 2014 was on show, whilst Christine Walsh put on the Blue Vest for a long-overdue competitive appearance. 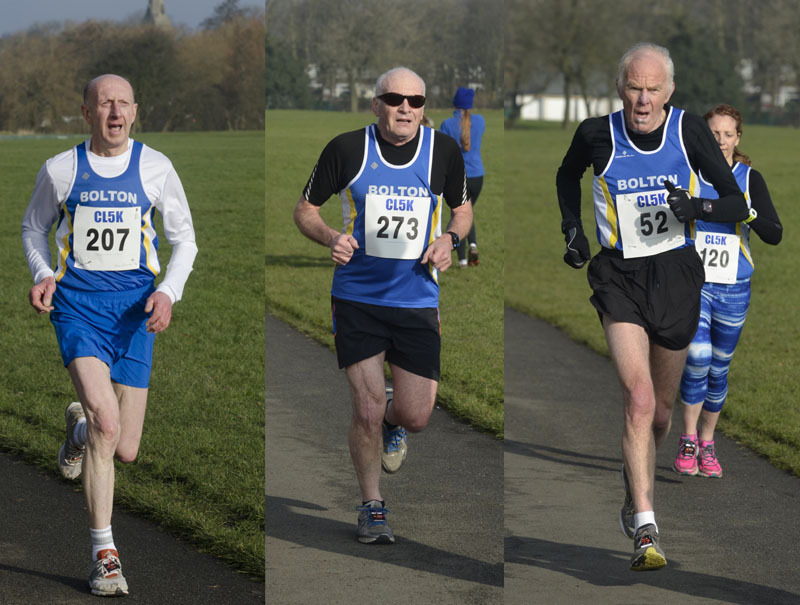 Bolton’s vets team smashed the opposition – 48 points to Horwich’s challenge (132), as it welcomed back Phil Boardman after an injury-hit year and David Tomlinson, appearing at 75 years young. As strong as ever, Eric Ranicar also stormed to the M65 win. No doubt BUH&AC’s Ken Fowler, as NVAC’s representative, had some input into a good Bolton vets turnout. Incorporated into the CL5K, the NVAC Championship saw M40 Nick Jones, England team member in last year’s British & Irish International in Nottingham, win the men’s title, placing 6th in the main race (16:22). On the podium behind were Robert White and M45 winner David Jackson. 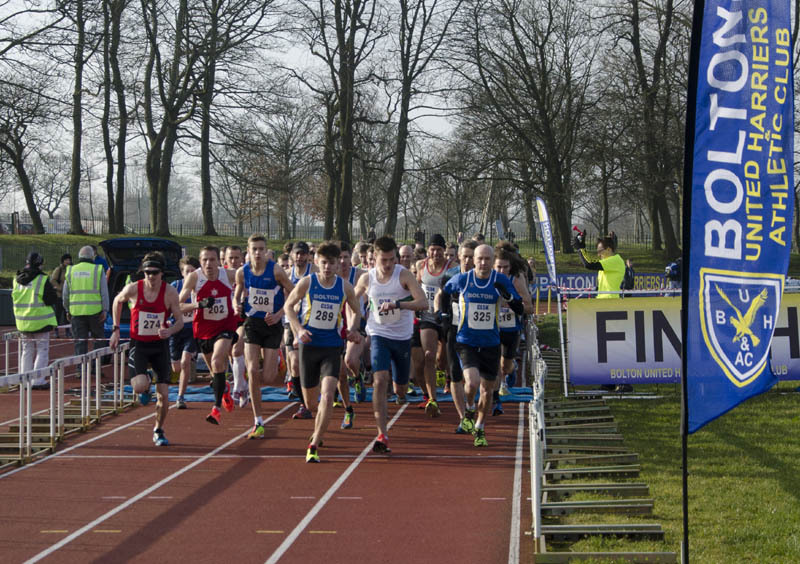 The women’s race was a close battle between Spenborough’s Lesley Leggatt (F55) and international fell champion Anne Buckley (F45), with just 7 seconds between them. Gwen Kinloch took bronze. With 50 runners (37 of whom were over the age of 60), it represented a great success as a qualifier for the British Masters series and possible international call-up. + the chipless Jane Lim somewhere!